"Built to reproduce the action of making pour-over coffee, but with much more ease." "Does everything you need, and just a little bit more, since you can select regular or bold coffee flavor without changing the amount of grounds used." "The hot plate...is engineered to roll the heat into the coffee in a way that won’t scorch or overcook it." "Speed is accomplished by having an ever-ready internal hot water supply waiting to brew your coffee when you want it." "Straddles the line between standard brewer and specialty machine." "When your coffee making needs are modest, this is the machine for you." "Includes...options that you’ll find in higher-end machines, yet it won’t break the budget." "Attractive for serving other beverages as well, whether hot or cold." "The conical burr grinder has five different settings, from fine to coarse, so you can customize the grind." "If your camping involves a camp stove, why not upgrade your coffee maker to make real drip coffee?" This drip coffee maker looks different than the usual, and it operates differently as well since it is built to reproduce the action of making pour-over coffee, but with much more ease. The water is heated to the ideal temperature in this machine, then a shower head sends the hot water onto the grounds in several cycles, starting with a short cycle to bloom the grounds for even saturation and more flavor. Operating this is simple since there’s just one dial to select the number of cups and to set a timer for up to 24 hours. An LED panel displays the current status including a freshness indicator. 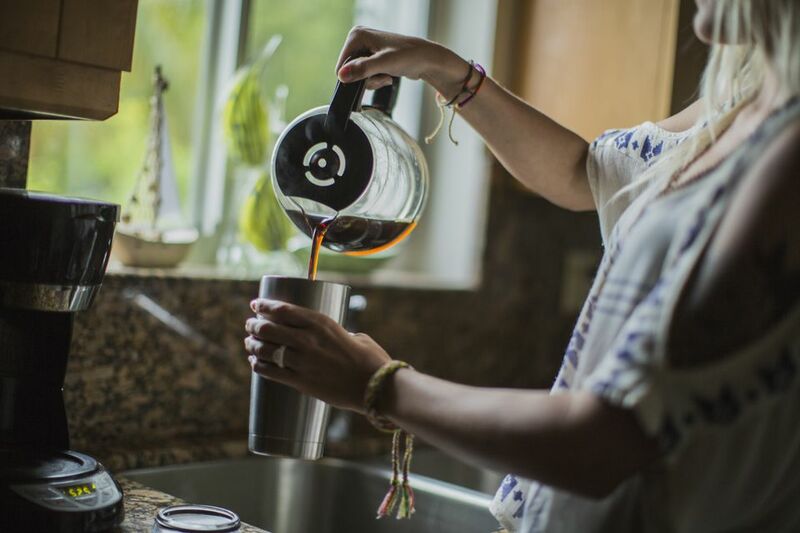 This makes up to 9 cups of coffee, which are held in an insulated stainless steel carafe. A similar model is available in a larger size. This coffee maker does everything you need, and just a little bit more, since you can select regular or bold coffee flavor without changing the amount of grounds used. While it can make up to 14 cups of coffee for a crowd, it can also make just one cup for those mornings when that’s all you need. The front panel has buttons for self-cleaning; bold flavor; brewing now and auto shutoff up to 4 hours later; programmed time up to 24 hours; and for brewing just 1-4 cups. The keep warm-temperature is adjustable, so you won’t come back to overcooked coffee or something that’s not warm enough, and the tone to indicate that coffee is done can be turned on or off. When it’s time to clean the machine, a light will let you know. Some people take their drip coffee seriously. Very seriously. This machine is handmade in the Netherlands and looks like something you’d see in a futuristic sci-fi kitchen. Unfortunately, a robot maid is not included. This brews up to 40 ounces of coffee in just six minutes, and if you’re too impatient to wait that long, the drip-stop feature will let you remove the carafe during brewing without creating a puddle of coffee on the counter. The hot plate on the model may be its most unique feature, since it is engineered to roll the heat into the coffee in a way that won’t scorch or overcook it, while keeping it at your choice of an even 175 or 185 degrees. After 1 hour and 40 minutes, the hot plate will turn off, so you won’t come home to a burned carafe. The BUNN name might seem familiar since BUNN coffee makers have been gracing diners, restaurants, and commercial kitchens for decades. This home brewer uses the technology of commercial machines and brings it to the home kitchen, where this speedy coffee maker can brew a full 10-cup pot of coffee in about three minutes. You’ll barely have time to find your favorite coffee mug. Rather than a cone-shaped filter, this has a large flat bottom filter for more contact between the water and grounds during brewing, while a multi-stream spray sends hot water over the top of the grounds to saturate them completely. For messy pourers, the carafe was designed to arc the coffee neatly into your mug and then wick the drips back into the carafe, so you won’t be cleaning up coffee drips each time you pour. If you don’t want a full pot of coffee, this can brew as few as 4 cups. Drip coffee makers aren’t known for their ability to make fancy brews, but this machine straddles the line between standard brewer and specialty machine. Much like regular drip machines, it can make a full carafe of coffee as well as half-carafes or cups and mugs in different sizes. While this doesn’t make high-pressure expresso, it does make small cups of concentrated coffee that can be used for making espresso-like drinks. It also has a built-in frother and a drip-stop toggle that will stop the flow of coffee into the carafe so you can grab a quick cup before the brewing is finished. This includes both a stainless steel carafe and a 50-ounce carafe that you can fill with ice to make iced coffee drinks straight from the brewer. When your coffee making needs are modest, this is the machine for you. There is just a simple on/off switch that turns the machine on to start brewing with an indicator light that shows when it’s on, so you’ll remember to turn off the warming plate when you pour the last cup of coffee. This makes up to four small cups of coffee or two standard mugs, so it’s great for singles or couples who drink just one cup each before heading out the door. The warming plate is easy to wipe clean and the filter basket is removable so you can empty it quickly and wash it for the next use. A pause feature lets you remove the carafe if you want to grab the first cup before brewing is done, then you simply replace the carafe to continue brewing. This very affordable coffee maker includes a lot of options that you’ll find in higher-end machines, yet it won’t break the budget. This has a 12-cup carafe and the ability to brew from 1-12 cups at a time, so you’ll always have the amount you need. Rather than pouring water straight through the grounds and into the carafe, this steeps the grounds before sending the coffee to the carafe, for a richer brew with more flavor. An LED display shows the time and lets you program the timer to have your coffee waiting for you when you wake up. A pause feature lets you remove the carafe to pour a cup of coffee when you can’t wait for the full pot to brew, then you simply replace the carafe to continue brewing. The warming plate has a nonstick surface that’s easy to wipe clean. This comes with a reusable gold-tone coffee filter as well as a carbon filter that removes impurities from the water before brewing. Pour over coffee is the manual version of more automated drip coffee. Rather than pushing a button to make the coffee, you’ll boil water and pour it over the grounds in several stages to fully saturate the grounds and extract the maximum amount of flavor. This includes a stainless steel mesh filter that lets the aromatic oils pass through while holding back the grounds. The carafe is made from heat-resistant glass and has a band around the neck that makes it easy to hold and pour from the integrated spout. The carafe is dishwasher safe for easy cleaning. When you’re not using it for making coffee, it would be attractive for serving other beverages as well, whether hot or cold. This brews from 2 to 10 cups of coffee and lets you select from mild, medium or strong brews, so your coffee is just the way you like it. The conical burr grinder has five different settings, from fine to coarse, so you can customize the grind. If you don’t finish the pot quickly, the keep warm function will hold the coffee at drinking temperature for two hours before it shuts off automatically. This has a digital display and just a few simple buttons that make coffee brewing easy. If you have pre-ground coffee, you can turn off the grinder and just use this to brew without grinding first. A reusable gold-tone filter is included. Sure you can boil coffee grounds in a beat-up pot on a campfire, but if your camping involves a camp stove, why not upgrade your coffee maker to make real drip coffee? This is made to fit over most camp stove burners and makes up to 10 cups of coffee. The camp stove heats the water in the reservoir, which then moves through the filter and into the carafe. Like many electric brewers, you can remove the carafe to stop the brewing while you pour a cup, then it ​resumes when the carafe is replaced. While this is meant for camping, it would also be handy if the power and gas are temporarily out, but you have propane to power your camp stove.